The Northern Territory's capital city is surrounded by incredible scenery, including some of Australia's internationally renowned national parks. If you're looking to discover Darwin's surrounds, there is no better way than to rent a car and follow the Stuart Highway out of the city. There are plenty of unbelievable locations to be found. Directions: Follow the Stuart Highway south from central Darwin. Take the exit for Arnhem Highway which takes you into Kakadu. 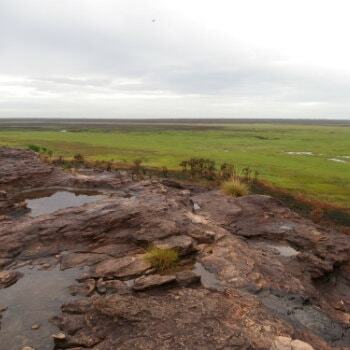 Top Attractions: Yellow Water Billabong, Nourlangie, Ubirr Rock Art Site, Mirrai Lookout, Cahills Crossing. One of Australia's most iconic national parks, there are plenty of reasons to visit Kakadu. The park is one of the best places in the country to learn about Aboriginal culture and see significant cultural sites. If you only have a day to explore Kakadu, make sure you do some research in advance so you can pick the sights you would like to see. The park is home to diverse Australian wildlife, including unique birdlife which you can spot at the Mamukala Wetlands. Visitors can also take a cruise on the Yellow Water Billabong where you can search for saltwater crocodiles. Directions: Follow the Stuart Highway south until you reach Katherine. Follow Gorge Road into Nitmiluk National Park. Top Attractions: Katherine Gorge, Edith Falls. 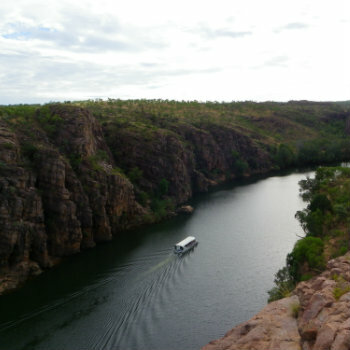 Katherine Gorge in Nitmiluk National Park is a must-see on any Northern Territory itinerary. Following the hiking trails along the gorge will lead to some truly unforgettable views. Try to visit from May to September, as during the wet season you are restricted from reaching some areas. On the way to Katherine Gorge, take a small break at the beautiful Edith Falls. Follow walking trails to get a great view from the top of the falls, and enjoy a swim afterwards below the falls. The area has become a popular swimming spot with the locals. Also close by is the Cutta Cutta Cave systems. The caves are millions of years old and of great significance to the local Aboriginal people. Directions: From Darwin, head south on the Stuart Highway. Exit onto Batchelor Road which will lead into Rum Jungle Road. Follow signs for Litchfield. 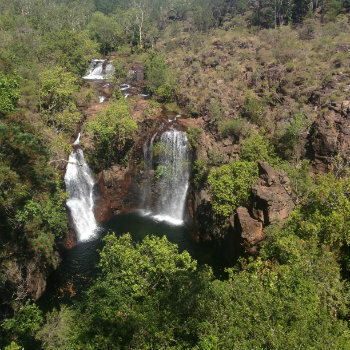 There is no better place to spend a day swimming beneath stunning waterfalls than Litchfield National Park. Home to popular waterfalls like Wangi Falls, Tolmer Falls and Florence Falls. If you follow the trail to Florence Creek you will arrive at the busy Buley Rockhole. The pools are another popular swimming spot. Waterfalls are not Litchfield's only tourism drawcard. Stop in and see the huge Magnetic Termite Mounds, or explore the unique rock formations in the Lost City. If you would like an aerial view of the park, helicopter tours are available. The tours offer a great, unique view of Litchfield. Directions: Leave Darwin on the Stuart Highway, and exit onto the Arnhem Highway to reach Mary River. To spot unique Northern Territory wildlife, a great day trip from Darwin is the Mary River wetlands. Not only is the area home to saltwater crocodiles, but also many species of birds. If you're interested in bird-watching, the region is home to birds such as the jabiru, brolga, and ibis. En route to Mary River stop at the Adelaide River, a great spot for spotting saltwater crocodiles. 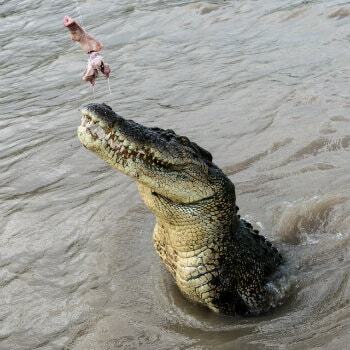 Take a Jumping Crocodile Cruise to see the massive creatures up close. You can also opt for a cultural tour to learn about the Aboriginal history of the area.